Saint Martha is taming dragons, punching assassins, and winning hearts. It seems that the last Queen of France is Secretly the Great Pumpkin! I assume that is what made the Second Unlimited Blade Works Box Set the #1 Blu-Ray of the week. If Saber is going to lose to anyone the main character from The Anthem of the Heart seems to be a worthy successor. You need ads like this to be the best selling Blu-Ray. Rin Tohsaka makes the Itasha a little less painful. I am just amused by the idea of Marie Antoinette as a Pretty Cure. Fate/Grand Order is getting figures. The three main women of the game Artoria, Shielder, Jeanne d’Arc are getting figures. if ANYONE is surprised that Artoria is getting a figure they have not been paying attention. Unlimited Blade Works pretty much sweeped up the Newtype Anime Awards. Now Saber is a staple of series outside of the Type-Moon Universe. Nitroplus games are not immune. Elizabeth Báthory gets a Halloween Special for the Halloween event in Fate/Grand Order. 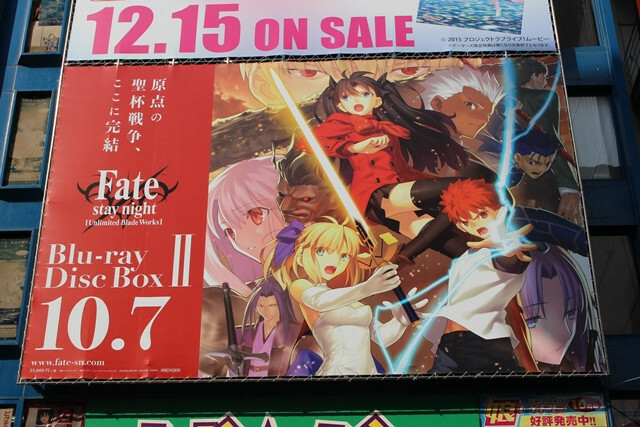 It turns out Japanese fans really want a Fate/Extra anime. I am curious how exactly they would adapt that series as an anime. Who would be the main Servant? Would they go with the male or the female protagonist? Because someone thought Misawa of Hell and Sasaki Kojirō go together. People can’t get enough of Gilgamesh in various outfits. Marmalade Voice of the People! Heavens_feel has finished another translation of a drama CD. If you like what he does maybe donate to his efforts over here. Something just have to be seen to be believed. Kotaku did a very brief article on Fate/Grand Order. It is mostly just a picture of the Grand/Order Character next to their historical counterpart. The comment section is mostly just people trying to one up the last guy about how disgusted they are.